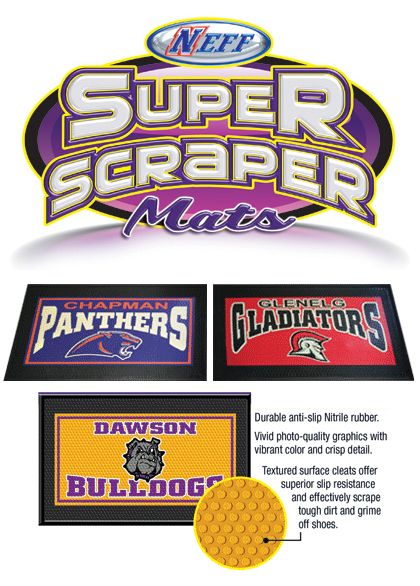 Keep your school floors dry and clean with new Super Scraper School Mats from Neff®. Ideally suited for all weather conditions, the Neff Super Scraper School Mat helps trap water and snow, dirt and grime-and keeps it off your floors. These school mats are impervious to sunlight and will not fade-making them the perfect choice for both indoor and outdoor entryways. Super Scraper School mats are easy to clean and certified anti-slip “high traction” by the National Floor Safety Institute. A short lead time of just three weeks makes these school mats even more appealing and each school mat is covered by an impressive three-year warranty.